Lots of grease, bad knees, a ton of sweat — and sometimes even a lack of appreciation from customers. What can you do as the owner of a body shop? You show some appreciation for your workers. And there’s no better way to do that than to always award — sometimes randomly, other times at parties, or both — the best branded auto tool kits you’d ever find at BRAVA Marketing. 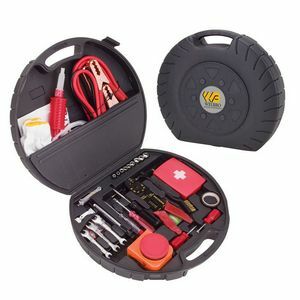 Why, You Ask, Would Branded Auto Tool Kits Be the Best Gifts to Give, Though? Aside from the fact that you may have auto mechanics supporting families and can save a buck or two by doing the repairs on their own vehicles, the fact is this: 9 times out of 10, you have to imagine that those hard-working auto mechanics would have the most souped-up vehicles and also love maintaining them. So giving them auto tool kits as awards or gifts would make them feel like kids in a candy store. Imagine the glory in picking up their own wrench, branded in your company name. You can’t buy that kind of love your employees would give you for offering such nice gifts. The ultimate result then is employee morale. Unbridled loyalty. Total appreciation. Appreciation for the work they do in your shop. There’s no better way to promote excellence on the job. You don’t even need to stop there — supply your business with just that: custom auto tool kits for use on the shop. Customers will see them. And customers will see that you’re a professional. Talk about killing those two birds with one stone. So what are you waiting for? View our website right now. Contact us today and also browse the many selections we have.